You can add pages to your survey to organise the questions, so that your respondents don’t have to load them all at the same time. Pages are also critical if you decide to include skip logic. Look for the Insert Page Here button in your survey. The button appears above or below existing pages. 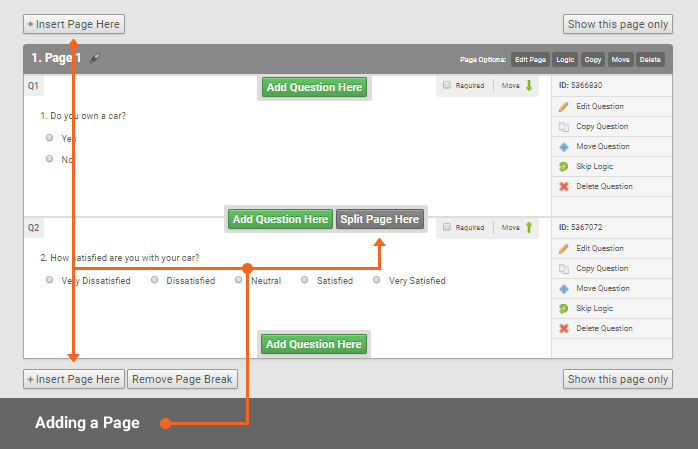 You can also split page by clicking the Split Page Here button in-between questions. Click the button where you want the new page to appear. Optionally, type a Page Title and Page Description. Click the green Save Page button. The Page Title that you enter on this screen will appear in other parts of the Survey Design screen. In particular, the title appears when you are building skip logic. We recommend that you use a clear page title to make it easier to refer to the page later. You can Edit, Copy, Move and Delete pages giving you full control of managing your survey. Edit Page Edit page allows you to change the page title and page description. Copy Page Duplicate the page which will then appear at the end of the survey, to move it into a position of your choice then use Move Page action. Question and page logic existing in the page you wish to copy will not carry over to the duplicated page. Move Page Organise your survey by moving the page into a position of your choice. Make sure to review any logic you have applied to the survey to ensure it is working correctly after moving pages. You can then choose where the respondent will go when they proceed to the next page in the survey. The logic options will allow you to send the respondent to a specific page, force complete the respondent, or disqualify the respondent. You can also apply Question Randomisation for a specific page. Delete Page Deletes the page from the survey.